Another quick inkblot drawing for day 26 of Art Every Day Month after a full day of family time. It was fun, but I'm wiped! I hope you all had a fun week! 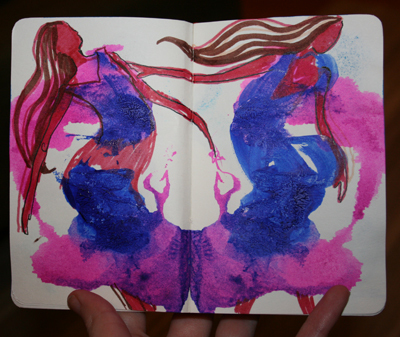 I really like this inkblot thing:) Great movement the dancer on the left. Ink blot or no, this has some great movement. It really works! I love ink blot paintings, though I call them butterfly paintings. I just love how the paint mixes together and the colours blend. These are great. What kind of ink/paint do you use for your ink blots? Thanks, Julie, I use Higgins and Liquitex inks and fluid acrylics. How cool! What a fun idea! Leah, the movement is great here. I definitely feel them dancing.